There are two tropical low pressure areas in the Northwestern Pacific Ocean today and they're close enough to each other to be captured in one image generated from data gathered by NASA's Aqua satellite. 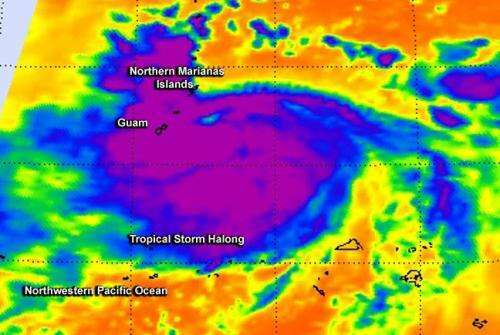 NASA's Aqua satellite flew over both Tropical Storm Halong and developing System 96W early on July 30 and the Atmospheric Infrared Sounder (AIRS) instrument captured infrared data on them in one image. Both systems show powerful thunderstorms stretching high into the troposphere with cloud top temperatures as cold as -63F/-52C. Those thunderstorms have the potential for heavy rainfall. The latest update from the Joint Typhoon Warning Center (JTWC) places the center of the storm about 75 nautical miles (86.3 miles/138.9 km) northwest of Navsta, Guam, near 14.4 north latitude and 143.4 east longitude. Halong's maximum sustained winds were near 50 knots (57.4 mph/92.6 kph). The JTWC expects Halong to strengthen to typhoon status by August 1. Halong was moving to the west at 8 knots (9.2 mph/14.8 kph). Halong is moving through the Marianas Islands and has generated a Tropical Storm Warning for Guam and a Typhoon Warning for Rota. To the west of Tropical Storm Halong lies the developing tropical low known as System 96W. Enhanced infrared satellite imagery on July 30 showed that System 96W appeared to be more organized. 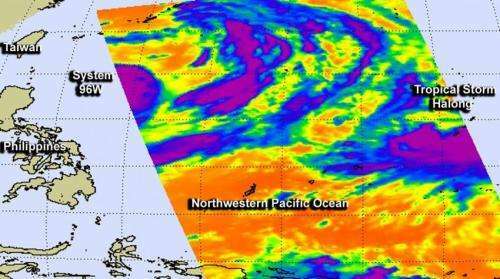 System 96W is now located near 19.9 north latitude and 130.5 east longitude, about 416 nautical miles south-southeast of Kadena Air Base, Okinawa, Japan. The Joint Typhoon Warning Center (JTWC) described System 96W as a monsoon depression with improved deep convection begins to consolidate as a typical tropical cyclone. Maximum sustained surface winds are estimated between 20 to 25 knots (23.0 to 28.7 mph / 37.0 to 46.3 kph. Minimum sea level pressure is estimated to be near 996 millibars. The JTWC gives System 96W a high chance of becoming the Northwestern Pacific's next tropical depression in the next 24 hours.